NWDA Recruitment for clerk, Steno, Engineers and Jr. Accountant job profiles. 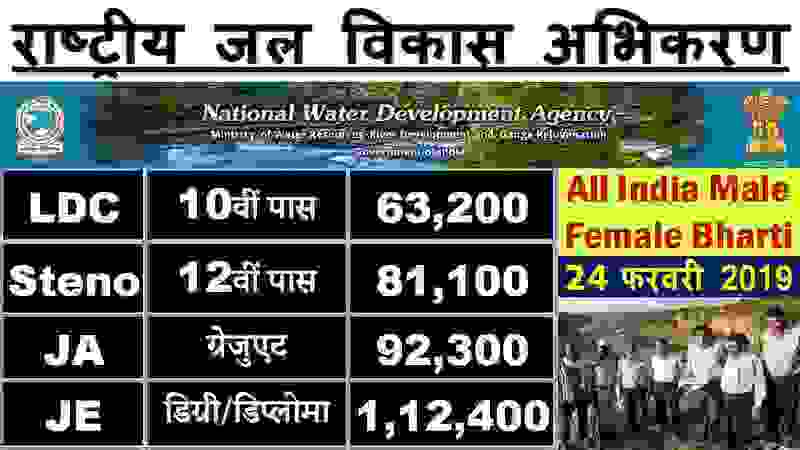 National Water development Agency Recruitment department is looking to recruit fresher Indian candidates for these job profiles. The are total 73 vacant positions for these job profiles which are going to be filled up through this Government department recruitment process. 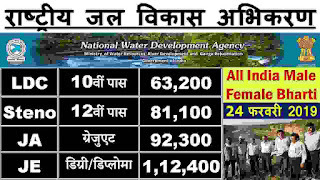 The National Water Development Agency (NWDA) is an Autonomous Organisation under Ministry of Water Resources, River Development and Ganga Rejuvenation, Government of India invites online applications from Indian Citizens for filling up the vacancies of Junior Engineers, Junior Accountants, Stenographers Grade-II and Lower Division Clerks on direct recruitment basis. The vacancies are tentative in nature and may decrease or increase as per requirement of the Organisation. The Age, Essential Qualification, Desirable Qualification, Number of Posts to be filled in the different categories and Scale of Pay are detailed below in this job posting article. Read it carefully before applying for these Government jobs in India 2019. Important Qualification: Having a 3 years diploma in Civil Engineering or equivalent from a recognized University of India can apply. Wanted Qualification: Those who have a Graduation Degree in Civil Engineering can also apply and preference will be given to the degree holder candidates. Important Qualification: Degree in Commerce from a recognized University or equivalent. Wanted Qualification: i) Should possess at least 3 years’ experience in handling commercial accounts independently and capable of preparing final accounts; and ii) Experience in finance/audit departments of Central/State Govt./ Autonomous bodies. Important Qualification: i) 12th class pass or equivalent from a recognized Board or University. ii) Minimum speed in English typewriting of 30 w.p.m. or Hindi typewriting of 25 w.p.m. Desirable Qualification: Knowledge of Computer operating system, computer peripherals etc. (i) For all posts mentioned above the selection/appointment will be made by conducting a competitive computer based online test from the eligible candidates after short listing, who fulfil the eligibility criteria explained above in this article above. (ii) Qualifying Skill Test in Shorthand/Typing Speed shall be conducted for the posts mentioned above. (iii) Qualified applicants in online examination test on merit basis will be called for Typing Test (Qualifying only) for post mentioned above. Typing Test will be conducted in English or Hindi with computer only. (i) The applicants who are wanting to apply for these Government jobs in India can apply online through the official website of the department. Before applying for the above-mentioned posts applicants should go through detailed advertisement and ensure that they fulfil the eligibility criteria as laid down in the advertisement as well as in the article above. Concealing of information or furnishing false information will lead to rejection of the candidature at any stage of the recruitment. The NWDA reserves the right to reject any application without assigning any reason whatsoever. (ii) Date of Online Test will be communicated to the eligible candidates through Call Letters and no enquiry in this regard will be entertained. Candidates are advised to visit NWDA website and their registered E-mail ID from time-to-time for getting latest information regarding recruitment process. (iii) Application fee related to this NWDA Recruitment process 2019 once paid shall not be refunded under any conditions nor can the fee be held in reserve for any other entrance examination or selection. Applicants are compulsory to verify their suitability before paying the examination fee. (iv) Candidates applying for more than one post should apply separately for each post and submitted fee for each post. (v) Candidates should have valid personal E-mail ID. It should be kept active during the currency of this recruitment process. The candidates are requested to check regularly their E-mail / NWDA’s website for any communication from NWDA.